We came across information that today, December 28th, is National Chocolate Candy Day. We aren’t sure how it started or who started this event, but we thought why not celebrate with advertisements from the past. 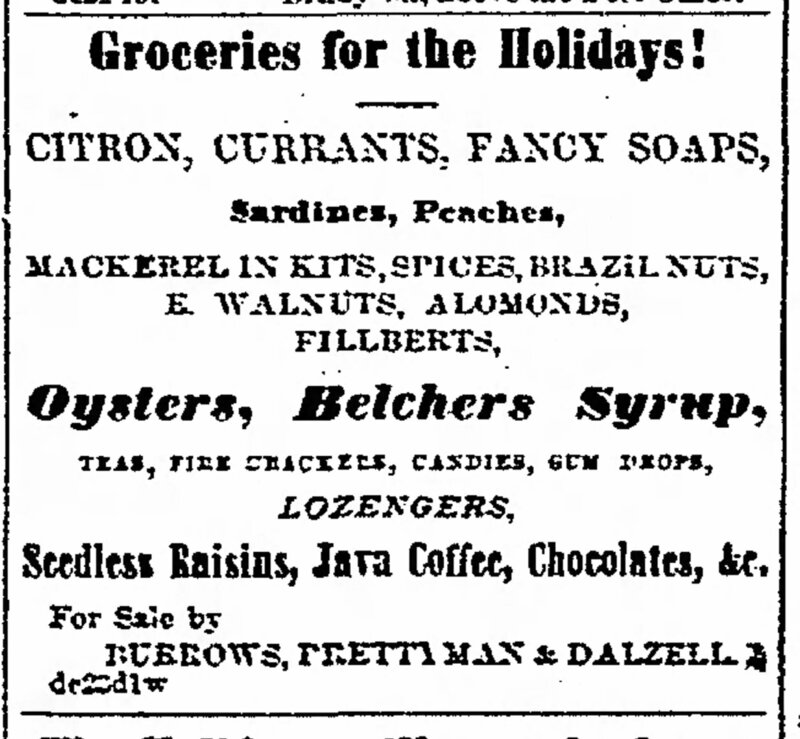 This store seemed to have all holiday treats, including chocolate, in stock for Christmas and New Year’s Eve 1857. The Morning Democrat, December 29, 1857. Pg. 2. 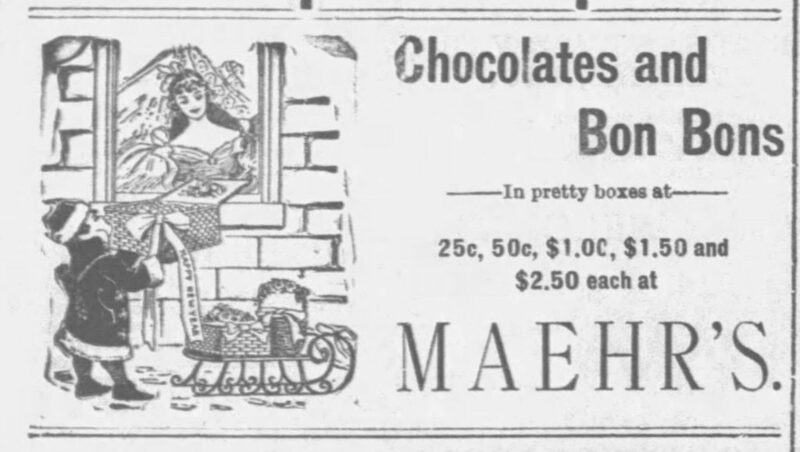 We are not sure how iced chocolate jelly balls were made in 1890. They would probably be refreshing on a warm summer day. Roddewig-Schmidt Cracker Company was formed in Davenport in July 1887. Soon after it began a confectionery branch that evolved into Roddewig-Schmidt Candy Company. The candy company was a leader in locally made chocolates until it closed in 1928. The Davenport Democrat, May 8, 1890. Pg. 1. We thought this advertisement captured the feeling of the holidays. The Davenport Democrat, December 23, 1898. Pg. 3. 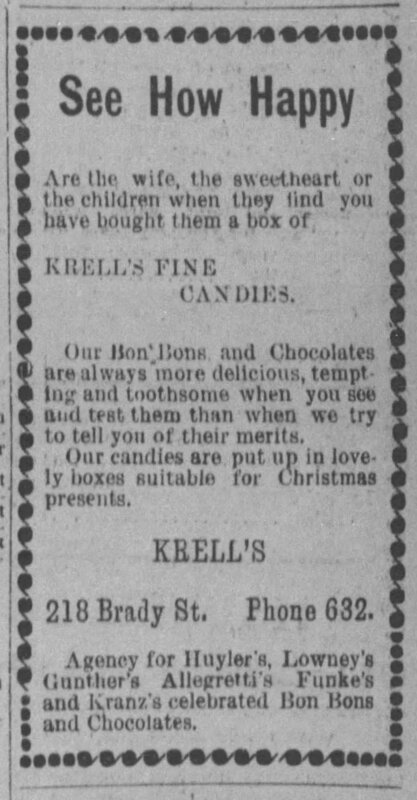 Krell Confectionery was one of the oldest confectionery businesses in Davenport when a fire destroyed the store on Brady Street in May 1921. In September of that year, owner J.W. Krell decided not to reopen the Davenport store; keeping only his Rock Island store in business. The Davenport Democrat, December 28, 1900. Pg. 5. 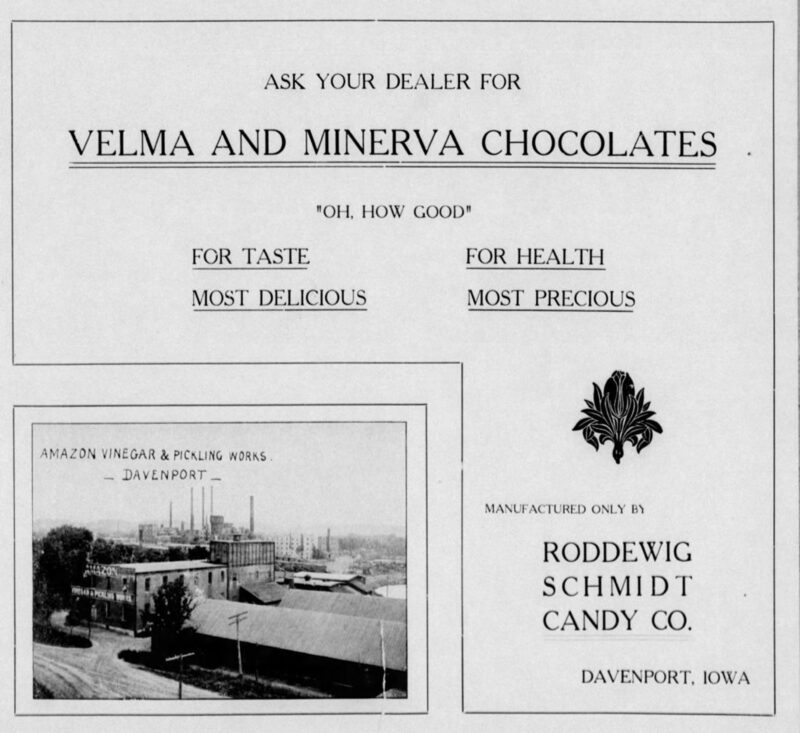 In the early 1900s, the Roddewig-Schmidt Candy Company introduced the Davenport made Velma and Minerva chocolates. 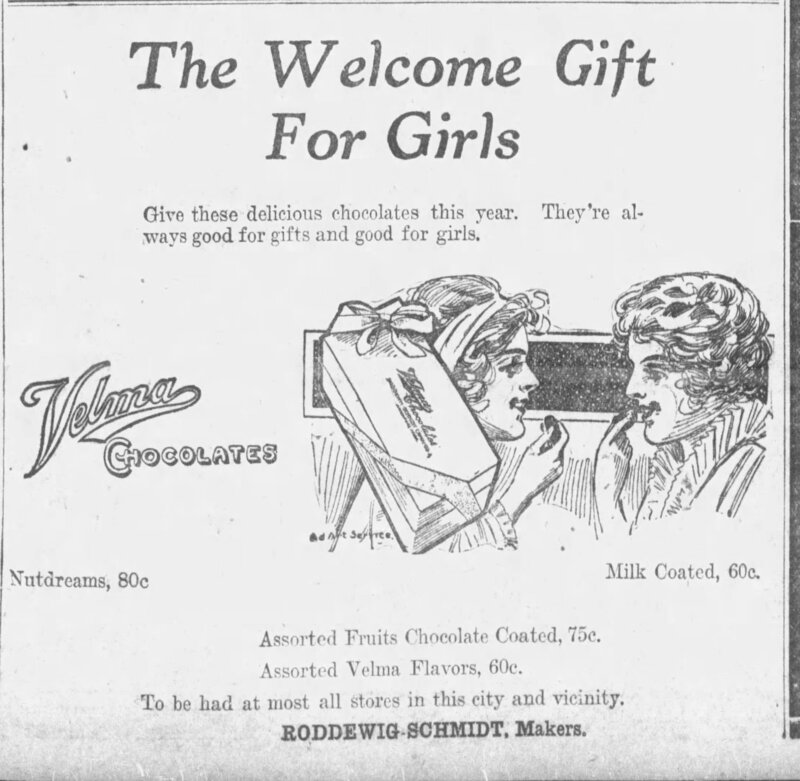 The Minerva chocolates were only produced in the sweet chocolate form while Velma Chocolates were produced in sweet, bitter-sweet, and milk chocolate varieties. The Half-Century Democrat Special Edition, October 22, 1905. Pg. 62. Of course, baker’s cocoa and chocolate were sold for those who desired to make their own candies at home. The Daily Times, December 30, 1905. Pg. 3. Advertisements may change in design, but the message seems to stay the same. The Davenport Democrat and Leader, December 16, 1913. Pg. 9. Don’t worry if you indulge a little to much after reading these advertisements. We found out that December 30th is National Bicarbonate of Soda Day! This entry was posted in Local History and tagged Chocolate, National Chocolate Candy Day, Roddewig-Schmidt Candy Company, Roddewig-Schmidt Cracker Company, Velma Chocolates. Bookmark the permalink.